This exquisite beach home offers beautiful views of the Gulf as well as the amazing views of the community from the second and third level balconies. Short walk or bike ride to the beach. Gulf Views From Balconies, Across From Barbados Pool, Short Walk Or Bike Ride To The Beach! 4 Bikes Included! This beautiful Rosemary Beach home is located just 5 homes from the Gulf of Mexico and is across the street from the Barbados pool. Upon entering Wade Cottage, you will immediately feel at home. With its designer furnishings, open living spaces, and quiet courtyard with a grill, this will surely become your favorite beach escape! On the first floor are 2 guest bedrooms both with private en-suites. The inviting king guest room has a private entrance, flat screen TV, and the private bath features a tub/shower combo. The spacious queen guest room has a private bath with walk in shower. The second floor houses the main living area. The large open kitchen, dining, and living room is ideal for family dinners. The large kitchen island offers plenty of work space and seating for 3. The chef will enjoy the 6 burner Viking stove, Subzero fridge, dishwasher, and microwave. The dining table seats up to 8 for those gourmet meals. Family can lounge on the cozy sectional sofa while waiting for dinner or step out onto the balcony that overlooks the streets of Rosemary Beach and has excellent gulf views! Also, on this level, is another luxurious king master with a private bath with walk-in shower. The laundry room and a powder room are also located on this floor. Up the stairs, the third floor features another large living area with a kitchenette and a game or dining table. This is a great space for the kids or teens. They will love the access to a mini-fridge, microwave and dishwasher. Just off the living area is a bunk room with twin over twin bunks. The bath on this level has walk in shower. Step out on the third floor balcony to enjoy fabulous sunsets over the Gulf of Mexico. 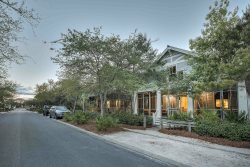 Be sure to make Wade Cottage your next 30A beach escape! 4) 4 bikes are included in the rental. To utilize, waiver must be signed and received before code provided. Please contact Saxon with Bikes4U at 850.399.1230 with any bike questions.